We’ve finally arrived, after an ATV accident (more on that later), a flight on a tiny prop plane, and a 4 hour drive through the rainforest we have arrived. We are at the Sloth Sanctuary. I’ve been dreaming about coming here since Vice first introduced me to this magical place… In fact when I interviewed for my current job I spent a good 25% of the interview telling Annie how much I wanted to come to this place. No wonder she hired me. Costa Rica is a fairly small country, you can get from one coast to the other in about the time it would take you to get half way across Ontario; the drive is prettier though, less moose more rainforest. 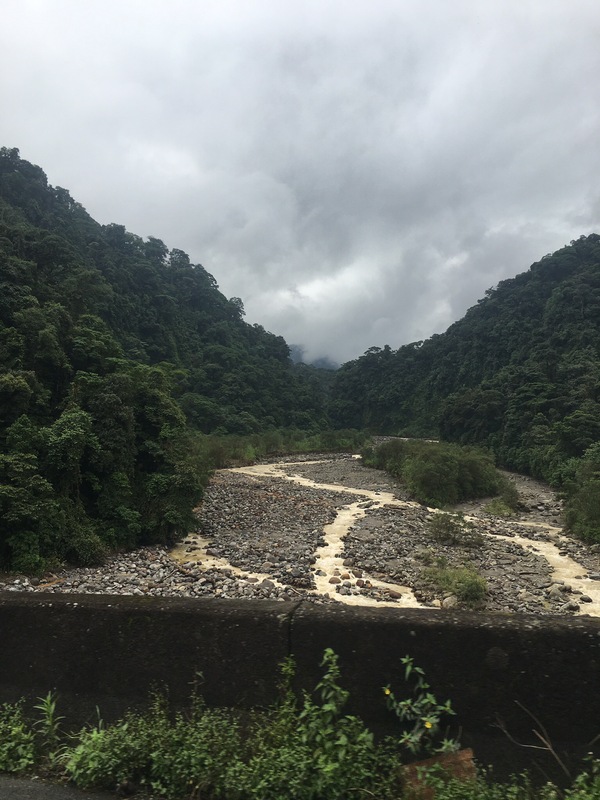 The road between San Jose airport and the Sloth Sanctuary, which is about 30 minutes from the beach town of Puerto Viejo, is basically a twisty, windy, foggy rainforest road through the sky – it’s awesome, if you’re the passenger. If I had planned our trip better I may have picked a resort on the Carribbean side rather than the Pacific side to cut down on travel time but if I’d done that we would never have been able to drive through a rainforest in the sky. So I guess it’s a toss up. 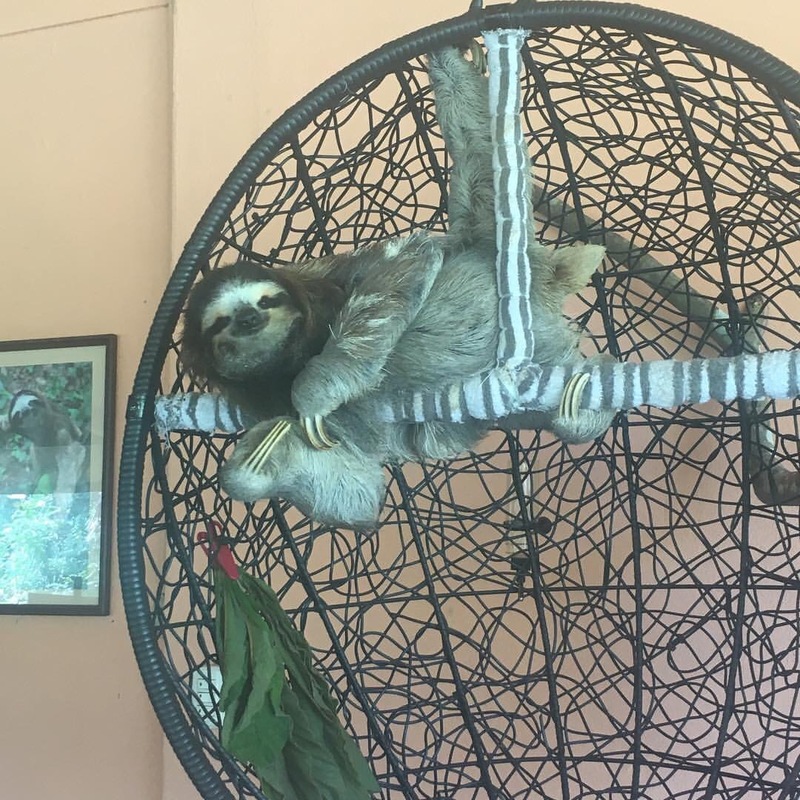 If you’re planning on coming to the Sloth Sanctuary it may be a bit easier for you if you stay at a resort in Cahuita or Puerto Viejo. When we arrived I managed to let the polite receptionist tell me at least 2 important details before I rushed off to meet Buttercup; she lives in the dining room in a hanging basket where she gazes upon her many fans. Buttercup is the world’s oldest known living sloth AND the founding member of the Sloth Sancutuary, saved by Judy & Louis Arroyo in 1992 Buttercup is the reason the sanctuary exists. 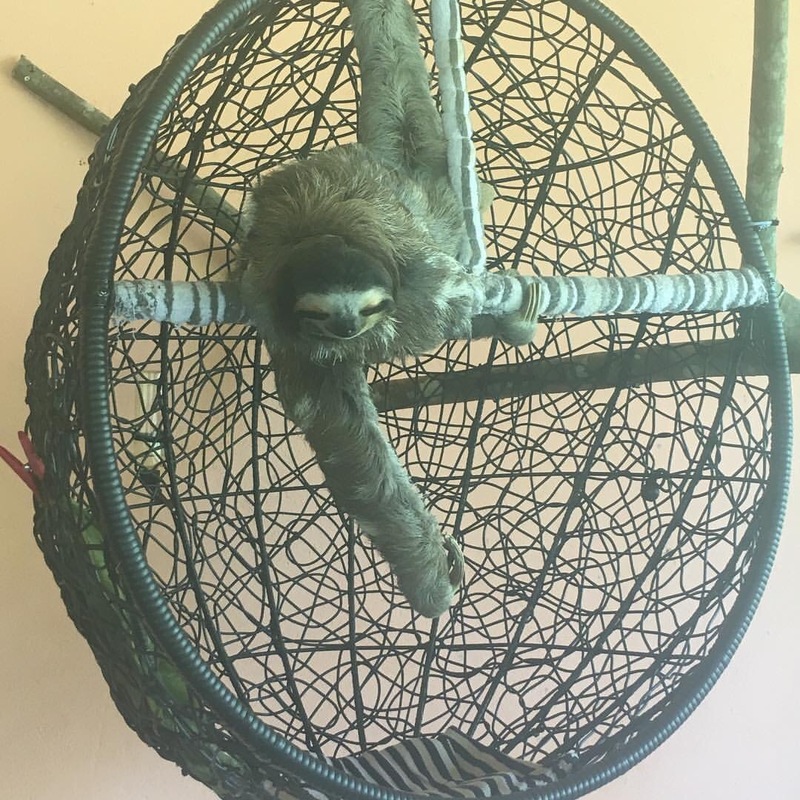 Tomorrow we’re taking the Insider’s Tour, a 4-hour tour of the sanctuary that includes: a visit to the “Slothpital” clinic, a tour of the NICU, behind-the-scenes look at the nursery and rehabilitation centre, and a canoe ride through the tropical forest that surrounds the sanctuary. So my tomorrow will likely be better than yours, unless you’re currently touring Madagascar and meeting the lemurs, in which case we’re tied. Now, about that ATV accident… On Sunday our Adrenaline Tour was cancelled because there weren’t enough people to warrant a bus coming to the resort, so we decided to go to a local-ish farm and jump on some ATVs. Fun right? I thought it would be. But then we flipped, which was less fun. So much less fun. In case you didn’t know ATVs should only ever be under you not on top of you. We’re both pretty injured, I’m kind of sure I have whiplash and the burn/bruise/cut on my arm is definitely going to give me a badass scar, but aside from that we’re OK. The owners of the farm insisted on making sure we were OK, they drove us to a clinic and to the hospital in Liberia for x-rays. Really they were just the nicest people. And lucky for us they’ve offered to make up for Sunday with a horseback ride on Friday, which is the perfect way to end the trip. More stories to come so stay tuned. Same sloth time, same sloth channel. Thanks! I will post more tomorrow.